These are such great ideas. The binder idea is wonderful. Hey, I recognized your template as soon as it came up. I almost used it for my personal blog. It's beautiful! Cool idea with the can. You are such the recylcer! the alphabet book is a good idea. 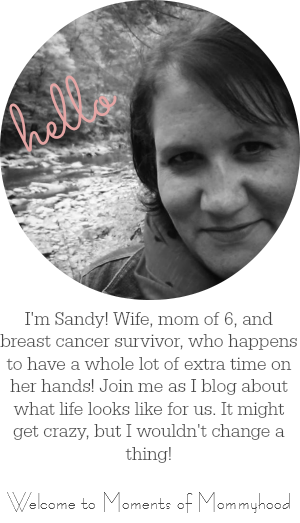 I'm new to your blog...can't remember how I found you, but wanted to let you know that your ideas are darling! Can't wait to try some of them out with my kiddos. Thanks for stopping by my SITS featured post today! I love meeting new bloggers! I love this idea! We did something similar with toilet paper rolls for O week - and it really looked artistic! We're having such fun going through the alphabet we're going to do it again when we're done. Great idea to turn it into a book!! You are an alternate winner for my giveaway! I love your plan for the alphabet pages... Maybe I'll start doing these with my kids as well. Love these Sandy. Are you going to do the whole alphabet in order? I just saw this on Lesson plans blog... I might jump in if you are going to do the whole abc's! It is so cute!